As really professional craftsmen know, Hultafors’ can deliver just about anything you need for measuring, leveling and marking; striking, cutting and chopping; even prying and wrecking. That’s why they’ a range of Tools that can handle tough applications, last for ages and feel right when you’re working on site. 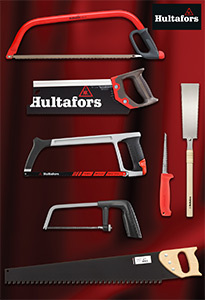 Hultafors’ HBX and HBS saws are well known for their top quality precision cuts and, to complement those models, there’s a brand new range of cutting and sawing tools that include – Bow Saws, general purpose Short Hand Saws,Hack Saws, a Jab Saw, a Concrete Saw plus a superb Japanese Ryoba Saw which is perfect when you need a tool for the finest cuts made with minimal force. So what makes these saws really different? Check out the blade tips for an easier start and ongoing sawing motion control; the easy-to-use blade exchange system; the extra-stable precision blades and the ergonomic to make sawing an easier and more precise experience. Getting more information on the Hultafors Tools range of Handsaws is easy. You call the Helpline on 01484 854788 or check out www.hultafors.co.uk and download a digital catalogue. Compressed Air Cleaning, when production and factory personnel are at work, it can often be tempting for them to find the easiest, or in their opinion, the fastest way of doing certain things. This is all well and good, but shortcuts can lead to individuals and companies running into major problems, and even falling foul of regulations that may be in place. One example of how OSHA regulations can be severely compromised is demonstrated when workers may choose to use a compressed air gun/nozzle to remove dust and debris from clothing and/or exposed skin. Compressed air tools are of course commonplace on factory floors, and to workers a compressed air gun may be the quickest and most convenient method of cleaning themselves down. However, the reality is that he/she may be creating a noncompliance, but more significantly, a potentially dangerous situation. Many companies will have written safe work procedures that outline how to perform a task with minimum risk to people, equipment, materials, environment and processes. Because of this most employees are well-aware that using compressed air nozzles to remove debris from clothes is a hazardous habit. However, despite this lots of workplace injuries still happen because of the misuse horseplay, and no matter how innocently it might start, it can end with disastrous consequences. It may be amusing to direct a jet of air at a co-worker, but these tools produce enough pressure to cause a severe internal injury such as embolisms which can be fatal. If employers are going to allow their workforce to use compressed air in the workplace, it is vital that they understand the appropriate regulations and to be aware of alternative technologies that can further reduce or eliminate the dangers. To acquire further understandings of what is safe and approved for clean down operations, Nick Wakley, ACI’s Health & Safety Officer answers some commonly asked questions. Q. What is your interpretation of the OSHA regulation regarding the use of compressed air for cleaning purposes? Factory air lines normally operate between 80 psi and 120 psi. Most pneumatic tools, including air guns, need high pressures to operate effectively. OSHA requires that when an air gun is dead ended (the tip of an air gun is blocked), the static pressure at the point of blockage is no more than 30 psi. Q: If there was one message or action you would take from the OSHA regulations for compressed air, what would it be? NWA: Although it states you should reduce the pressure of your compressed air lines to less than 30PSI, there is plenty of proof that even running lines at less than 5-10PSI can still cause injury if used on exposed skin. For my own point of view, I prefer to be completely sure everyone is safe and follow the simple rule that under no circumstances should employees use compressed air for clean off clothing or skin. If your employees need to clean themselves down, find a safer alternative solution. Q: What exactly are the hazards of using compressed air? A misdirected jet of compressed air to the head can cause serious eye injuries or rupture the eardrum. Aiming the compressed air into the mouth can damage the lungs and oesophagus. Careless use of it to blow away dirt or dust from the body, even with a protective layer of clothes, could allow the air to enter the body, which can damage the internal organs. The most serious damage that can be caused by it occurs when air is blown in under the skin, for example via an open wound. This can lead to an embolism, in which air bubbles are pressed into the veins and transported along the bloodstream. If the air bubble reaches the heart it causes symptoms similar to a heart attack. If the bubble reaches the brain, it can cause a stroke which can be fatal. Finally, since compressed air usually contains small amounts of oil or dirt, severe infections can also occur if the compressed air enters the body. Q: If cleaning buy phentermine hong kong down with compressed air guns & nozzles going to continue, what safe measures can be taken? Never point an air hose or air gun at anyone, either for fun or to blow away dirt from clothes or the body. Never point at exposed human skin. Always use personal protective equipment, such as goggles, when cleaning with compressed air. Check the air hoses regularly for damage or leakage and remove any leaking hose immediately. A hose that breaks under pressure will come loose and wave around completely uncontrolled. Excessive noise generated in the workplace can be harmful and compressed air gun/nozzles can contribute to high levels of occupational noise. Every precaution should be taken to reduce this.Remember to always treat compressed air and related components as professional tools – something that facilitates your work, but only if handled properly and safely. Q: Where are the OSHA regulations applied and are there any other regulations that apply to this issue? NW: The US only is officially regulated by OSHA (Occupational Safety and Health Administration), although from my experience more and more companies outside of the US are using OSHA for their own guidelines. SUVA is a Swiss body which has issued similar recommendations and rules. Q: If you are looking to remove the use of compressed air guns & nozzles in your workplace for cleaning purposes, are there any safe alternatives? Another option that eliminates all risks and facilitates de-dusting and cleaning of personnel is called the ‘JetBlack’. This is a blower powered (1400 watts) solution that removes dust and debris from clothing or skin using high volumes of air at low pressure. It operates at less than 2.53PSI (70In.SWG) and can be directed safely at exposed skin with no risk of harm at all. Its’s quite safe for all personnel cleaning requirements. The unit also offers users the advantage of being much quieter with noise output being less than 78dB(A). This is significantly quieter than compressed air and well below the level of 85dB(A) level that can lead to hearing loss. Q: Is ACI’s JetBlack OSHA compliant? NWA: There are two versions of the ACI JetBlack. One is a wall mounted unit intended for fixed cleaning stations to be used by personnel, and the other is a portable unit ideal for cleaning and removal of debris/dust from machinery or workspaces. Both are OSHA compliant as they are fitted with a chip guard, and operate at a low pressure. Q: What happens when the dust is removed using a JetBlack? NWA: Any dust or contaminant removed/blown off from clothing using a JetBlack will be airborne. 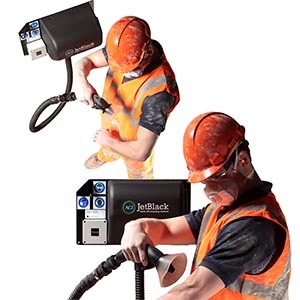 Although this is not ideal, the JetBlack was designed to simply replace all compressed air nozzles and guns for removing dust from personnel quickly and effectively. If the removed dust particles do need to be extracted, ACI offer the Personnel Cleaning Booth which is a self-contained, free-standing dedusting system. This is a highly effective unit for removing, extracting and collecting dust and debris from employee’s dirty work clothes. The Cleaning Booth incorporates the company’s blower-powered JetBlack personnel dedusting system and delivers a high volumes of filtered air at low pressure, sufficient to remove powders and dust effectively and safely. In operation, the integrated JetBlack is used by Booth occupants to dislodge all dust and fibres. These are then drawn down and away from occupants through a grille floor by a vacuum effect created by an external blower. https://www.1stsafetynews.com/wp-content/uploads/2017/10/Air_Controlled_Industries_Compressed_Air-Cleaning.jpg 197 300 1st 4 Media https://www.1stsafetynews.com/wp-content/uploads/2018/02/1stSafetyNewslogo-300x146.jpg 1st 4 Media2017-10-06 11:34:182018-02-26 22:32:10Compressed Air Cleaning Is Still Used For Clothing And Parts Of The Body – But Is It Really Safe? DURA Automotive Systems is an independent designer and manufacturer of automotive components, including control systems, exterior systems and lightweight structural systems. DURA markets its automotive products to Global Original Equipment Manufacturers (OEM), including leading Tier 1 automotive suppliers. At Dura Automotive Body & Glass Systems, based in Birmingham (UK) they manufacture products that includes Steel and Aluminium Doors, Impact Beams, Glass Encapsulation, Plastic Cappings, Exterior Trim and Electric Park Brakes. Within their large facilities, DURA operative regularly handle a variety of materials that includes glass, plastic, steel and aluminium alloys. Manufacturing high volume parts from these materials inevitably creates a working environment where machine operators are being frequently exposed to airborne particles and fragments. So dust and swarf can quickly contaminate clothing and even stick to operator’s skin. “The use of compressed air lines to clean oneself is a disciplinary issue, however some have previously used this”, states Olii Lebrun, Engineering Manager for Dura Automotive. He continues, “As a company dedicated to Health & Safety best practice we searched for a solution that would eradicate the use of compressed air lines for removing this, and any other debris, as it is a dangerous practice phentermine weight loss with potential to cause gross harm to operators. A safer alternative had to be found”. To address the problem, DURA installed a wall-mounted ACI JetBlack blow-off cleaning station in the work zones that have the highest exposure and / or risk. “Since the JetBlack system operates on the principle of low pressure, high volume airflow it is categorically safe to use, even directly against human skin. This technology also ensures strict Occupational Safety and Health Standards (OSHA) are responsibly met by the company. The installation of our JetBlack unit ensures all DURA personnel have an effective and efficient way of clean down in the safest possible manner”, continues Oli. Oli concludes, “The installation of JetBlack cleaning stations has provided the ideal workplace solution for removing dust and debris safely. The ease of use in which the unit operates and functions has been a triumph with all integrated teams and employees. We would highly recommend any company that is currently seeking replacement of compressed air lines to look no further and use ACI JetBlack Cleaning Stations!”. Spill containment and spill control industry expert Empteezy has proof positive from three independent tests that its emergency tank shower (SE-VTS-1 tank shower) meets the rigorous standards set out by the American National Standards Institute (ANSI) and the three European Standardisation Organisations (CEN, CENELEC, ETSI). Instead of simply going through a process of self-certification, Empteezy, which recently celebrated its 30th anniversary, has truly gone the extra mile and elected to have its tank shower undergo three independent tests to prove its compliance to international standards. Empteezy worked with IAPMO R&T, North America’s premium plumbing and mechanical product certification agency to demonstrate that the SE-VTS-1 tank shower, which distributes 75.7 litres of temperature regulated water per minute for 15 minutes met with ANSI standard Z358.1-2014. In addition, Empteezy worked with Applus+ Laboratories to verify the product’s compliance with the ANSI standard. Applus+ Laboratories also tested the emergency tank shower to verify its compliance with the European Norm (EN) standard for one piece of safety equipment. The product passed the test with flying colours. Commenting on receiving the accreditations, founding director of Empteezy, Bruce Wishart said: “I am thrilled the tank shower has achieved the ANSI and EN standards, it’s testament to the high-quality products Empteezy is associated with. “Undertaking the test was entirely voluntary, but we were extremely confident in the tank shower’s credentials and knew it would achieve the pass it deserved”. Andrew Lawrence, business development manager at Empteezy continued: “The tank shower’s new accreditations put it a class of its own, but also marks the next phase in the company’s business development through being able to showcase it on a more phentermine 37.5 reviews 2011 international stage. 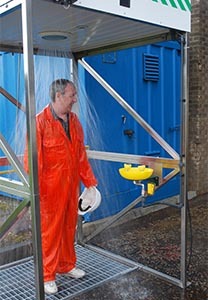 Now fully compliant with two international standards (ANSI and EN) and verified by two trusted independent test bodies, the tank shower is set to achieve international recognition within the emergency shower and decontamination industry, and expected to further boost Empteezy’s 18% increase in exports from 2016. The tank shower is available with options that include; PIR sensor activated light, eye wash, foot plate activator and digital temperature & water level gauges. The 2,000 litre water tank capacity provides a gravity fed flow rate that surpasses the standards requirements, even when an optional eyewash is running at the same time, and the heater ensures tepid water. 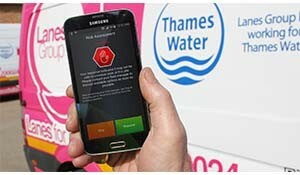 For more information, and to find out how your business could benefit from expert spill control and containment advice, visit www.empteezy.co.uk. Founded in 1986, Empteezy is the home of quality engineered spill containment and spill control products from oil and chemical storage containers, absorbents and spill kits (including spill kit training), emergency safety shower and tank shower applications to waste handling fork lift attachments. Products are tailored to meet the requirements of a variety of different working environments including; industrial, commercial, military, marine and educational. 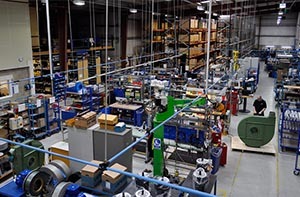 Empteezy manufactures in excess of 70% of its products in its own factories, making it well placed to provide expert advice on how to meet UK, EU and International Standards. David Frew, Head of Sales and Marketing for Labcraft, commented, “Over 2000 customers have successfully deployed Labcraft’s Banksman solution reducing damage to the vehicle, keeping staff safe and increasing uptime on the road.” The Labcraft Banksman lighting system can be installed at various points around the underside of the chassis and provides a bright carpet of white light around the vehicle. This significantly improves driver visibility enabling them to avoid obstructions in dimly lit areas reducing damage to the vehicle, to property and reducing the risk of serious injury to 3rd parties. The solution is applicable to any commercial vehicle that is required to manoeuvre in areas of insufficient or poor lighting. Banksman solutions are simple to install and connect directly to the vehicle loom. This innovative solution can be fitted as standard to new vehicles or retrofitted to an existing fleet. All lights in the Banksman Range offer Labcraft’s industry leading 10 year warranty which, in most cases, matches the life of the vehicle, offering true ‘fit & forget’ lighting solutions. All Labcraft products are exclusively manufactured in the UK and meet vehicle e-type approval. Customers who have installed the Banksman system have found significant reduction in costs attributed to vehicle repairs and time off the road due to accidental damage. This has led to collaboration with Industry Bodies and leading vehicle manufacturers focusing on reducing deaths, damage and injury by commercial phentermine 37.5 surgery vehicles. Temperature Controlled Units, Rigids, Trailer Units, Curtain Sides, Vans and Emergency Vehicles have all successfully deployed Labcraft’s Banksman solution reducing personal injury and damage to the vehicle and property, keeping staff safe and increasing uptime on the road. Labcraft are also proud to have picked up the TCS&D Health & Safety Award 2016 for the Banksman Lighting Solution at this year’s Awards Dinner. Labcraft are a family owned UK designer and manufacturer of low voltage LED lights, based in Saffron Walden Essex. Established in 1956, they have a reputation for high performance low voltage LED lights for the Commercial & Emergency Vehicle, Leisure and Marine sectors. Exporting to over 30 countries around the world, Labcraft are an ISO9001 and 14001 certified company. Labcraft are Europe’s market leading UK designers and manufacturers of low voltage LED lighting for the Commercial & Emergency Vehicle, Industrial, Leisure and Marine sectors. Established in 1956, Labcraft have a strong reputation for innovative high quality LED lighting solutions with distinctive design features. 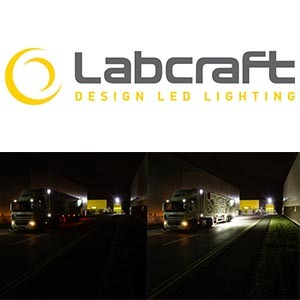 All aspects of technical and product design are carried out in-house, with 100% of Labcraft’s LED products manufactured in their factory in Saffron Walden, Essex. Labcraft also have a strong environmental ethos running through the whole business, which reinforces their manufacture of LED lighting, and are an ISO9001 and 14001 certified company. Lanes Group has won a RoSPA Gold Award for occupational health and safety for the sixth year in a row. The achievement means Lanes Group, the leading drainage and maintenance specialist, retains its RoSPA Gold Medal. 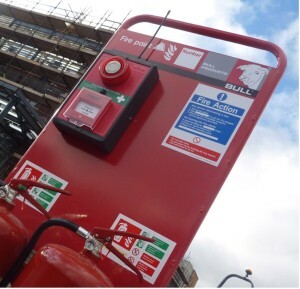 Hard on the heels of the recently launched Cygnus wireless fire alarm system, Bull Products has now introduced a new combined first aid alert and call point alarm module for the system.